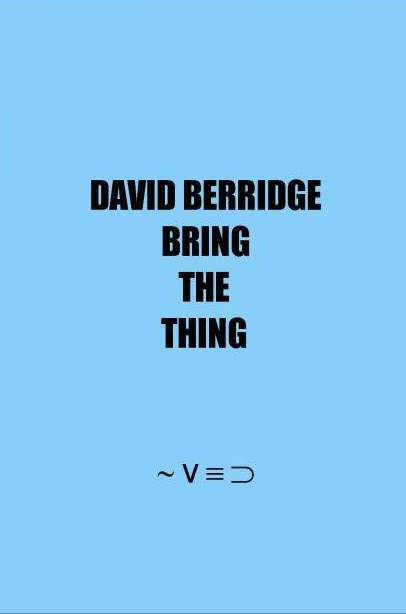 if p then q is very pleased to announce the publication of David Berridge’s Bring the Thing. 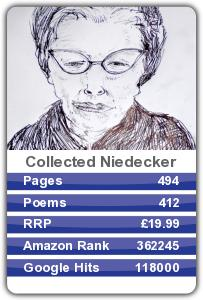 Information on how to buy below, as well as a sampler (and reading at the Free Verse poetry fair see previous posts). Bring the Thing takes the form of 100 days. The work is characteristic of the balance in Berridge’s work between humour and pursuit: in this case the pursuit of the Heideggerian thing. What is a thing? How do we find a thing? Can we make things things and what thing do we make them? David Berridge is the author of many collections including Black Gardens and The Moth is the Moth this Money Night Moth. He curates the website, publisher and proceedings at Very Small Kitchen. And has his own website David Berridge. if p then q invites you to play What’s The Best? poetry trumps at The Free Verse Poetry Fair. The game is played using the cards made by Joy as Tiresome Vandalism. There will be four sessions taking place at the bookstall on the hour at 1, 2, 3 and 4 o’clock. Up to four people can play in any given session. The winner will claim the set as a prize. The game is won when a player has won all the cards from their opponents or is the person with the most cards after ten minutes. Get in touch to book a slot or turn up on the day to play. 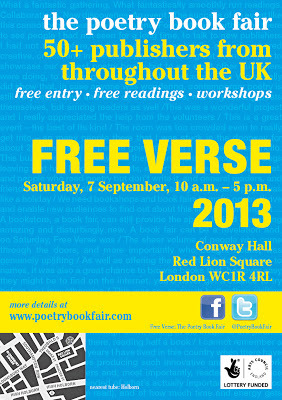 We are delighted to announce the full programme of free readings at this year’s Free Verse Poetry Book Fair! All readings are free to attend. They start in the day, at the Book Fair itself at Conway Hall, and will then go on into the evening at the nearby pub The Square Pig and Pen. 10.30 Picador Lorraine Mariner, whose first collection Furniture was shortlisted for the Forward Prize for Best First Collection and the Seamus Heaney Centre for Poetry Prize. 11.00 Knives, Forks & Spoons and West House Books Geraldine Monk, Alan Halsey, Paul Sutton and Mark Burnhope reading from recent work published by KFS and West House Books. 11.30 Veer Books Ollie Evans, Drew Milne and David Ashford reading from recent Veer publications. 12.00 Reality Street Peter Hughes launches his Reality Street collection Allotment Architecture. 12.30 Valley Press Matthew Hedley Stoppard, Jo Brandon and VP publisher Jamie McGarry present readings from their own works, and highlights from the Yorkshire-based publisher’s five-year poetic backlist. 13.30 Shearsman Books Launch for 2013 Chapbook Series. 14.00 Flarestack Poets Nichola Deane reading from her pamphlet My Moriarty, a winner in the 2012 Flarestack competition and a PBS pamphlet choice. 14.30 Five Leaves Press Contemporary Yorkshire Poetry: Ian Parks introduces and reads from the recent anthology Versions of the North. 15.00 Eyewear Publishing Caleb Klaces reading from his collection Bottled Air, winner of Eyewear’s Melita Hume Prize in 2012. 15.30 Ward Wood New Poets Showcase featuring poets published in Bedford Square 6: New Writing from the Royal Holloway Creative Writing Programme taught by Andrew Motion and Jo Shapcott: readings from Judi Sutherland, Caroline Squire, Lavinia Singer and Sara Nesbitt. 16.00 Mulfran Press Helen Lovelock-Burke reading new work, and Jenny Lewis reading English translations of Arabic poetry by Adnan al-Sayegh from Now as Then: Mesopotamia~Iraq. 16.30 New Departures/Poetry Olympics Performers include singer-songwriter Vanessa Vie, and editor-poets Adam and Michael Horovitz – who will be performing from Adam’s Turning (Headland Publications), and Michael’s three recent Jazz Poetry SuperJam recordings (Gearbox Records). at The Square Pig & Pen (WC1V 6NX), 6pm-9pm 18.00 Arc Publications Christopher James reading from his second collection Farewell to the Earth, and Astrid Alben, Anglo-Dutch poet reading from her first collection Ai Ai Pianissimo! 18.30 Seren Books Will include Marianne Burton reading from her debut She Inserts the Key. 19.00 Nine Arches Press Chris McCabe and Jeremy Reed reading from their recent psychogeographic collaboration about London Whitehall Jackals. 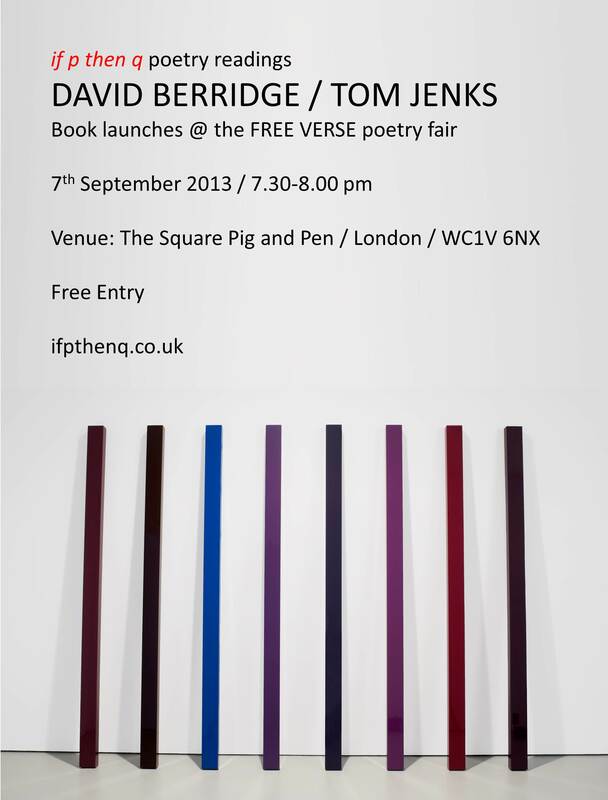 19.30 if p then q Tom Jenks reading from Items and David Berridge reading from Bring the Thing. 20.00 Egg Box Poets from the Stop/Sharpening/Your/Knives 5 anthology introduced by Jack Underwood. 20.30 Burning Eye Books Bang Said The Gun presents Dan Cockrill, Martin Galton, Peter Hayhoe and Salena Godden.